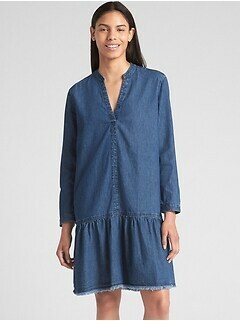 With women's denim dresses from this inspired line by Gap, you'll have a fashionable look for a number of occasions. 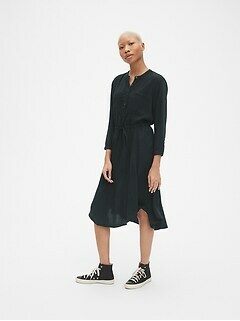 Browse this amazing selection at Gap, and find the denim dress that works for your individual personality and attitude. Manufactured from handsome denim, these brilliant dresses are iconically American, chic and eye-catching, yet familiar and approachable. Blue denim is a mostly-neutral shade that will work well with that bright yellow handbag, those brown leather booties, or your favorite wide-brim straw-colored hat. Choose from a variety of designs, including overall-style dresses, fit and flare dresses, tank designs, and shirt dresses that pair traditional fashion with modern sensibilities. Soft to the touch, and with the right amount of give, denim is truly a special material. Do you need a cute look for a BBQ with family? Perhaps you're just after a fabulous dress for a picnic in the park with your pals, or an afternoon window shopping on that strip of hip boutiques. Wherever your agenda may be taking you, you'll find designs from this selection at Gap are up to the task. With a dress from this line in your closet, you'll have a go-to garment for many different settings. Add one to your collection today, and discover fantastic new possibilities. 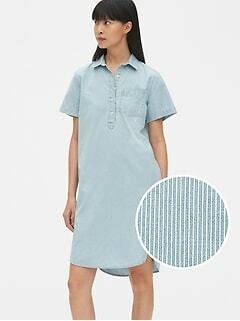 Easy to accessorize, these denim garments from Gap dress up, or dress down in no time. Wear a stunning denim number, carry an elegant clutch and rock your best heels, and you have an outfit for a night out on the town. Pair a dress from this line with black army boots and a backpack, and you're all set for that weekend music festival. From casual and fun, to sophisticated and refined, these garments can do it all. Enjoy maximum adaptability, and a fit that's as comfortable as your favorite pair of blue jeans, with denim creations from this selection. 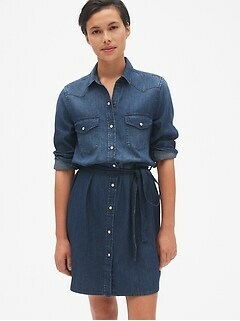 Add a women's denim dress from Gap to your closet today, and begin creating a signature new outfit.